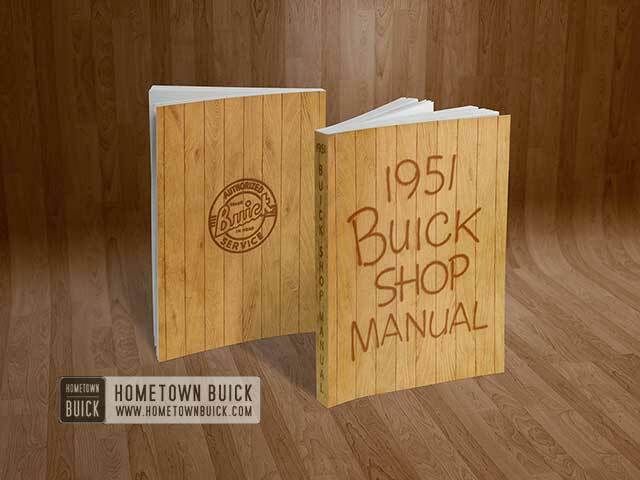 The 1951 Buick heater and the defroster are separate units which may be used together or independently as desired. The underseat heater provides circulation of heated air at floor level. The defroster provides circulation of heated air at shoulder level as well as defrosting of the windshield. Both units contain water cores which are connected by hoses to the 1951 Buick engine cooling system. 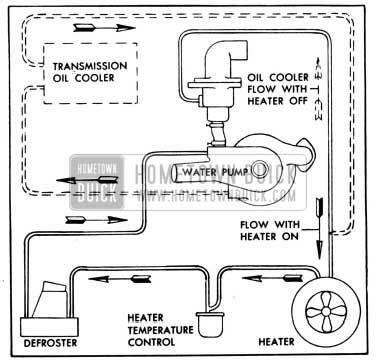 The hot water supply is taken from the radiator thermostat housing on the outlet side of engine water pump and is returned to engine cooling system on the inlet side of pump. The volume of hot water flowing through the heater and defroster cores is regulated by a thermostatically actuated temperature control valve mounted on the dash and connected into the water supply line. See figure 11-2. The 1951 Buick heater is mounted in the floor of body under the right side of front seat. It contains an electric blower which draws air from the body through the hot water core and recirculates the heated air at floor level. The defroster is mounted on the right side of cowl under the hood. Outside air is supplied to the defroster by the right hand ventilator duct, which contains an electric blower to provide forced circulation when required. The volume of air passing through the defroster core is controlled by a fly valve inside the defroster housing which is connected by a wire to the control knob on instrument panel. The heated outside air then flows through ducts to openings along the base of windshield where it moves upward against the windshield, which deflects the flow rearward into the body at shoulder level. The 1951 Buick heater blower is controlled by a “HEATER” switch mounted on the radio speaker grille. When heater switch knob is turned fully counterclockwise the blower is turned off. Turning knob clockwise, the first step gives high speed blower operation and the second step gives low speed operation. The defroster blower switch and the air valve control are combined in one unit mounted on the radio speaker grille. 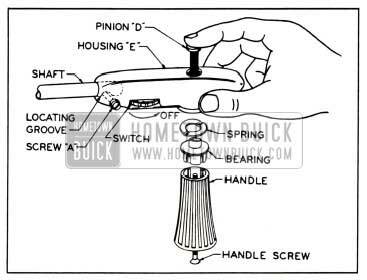 Pulling out the “DEFROSTER” knob opens the air valve and turning the knob clockwise turns on the defroster blower. The defroster blower has only one speed. The 1951 Buick heater temperature control is manually set to the desired body air temperature by moving the “HEATER CONTROL” lever located below the radio speaker grille. The control lever has four marked positions: “OFF”, “LOW”, “NORMAL”, and “HIGH”, which are self-explanatory. Once set for a desired body temperature the temperature control unit will automatically maintain this temperature without further adjustment of the control lever. 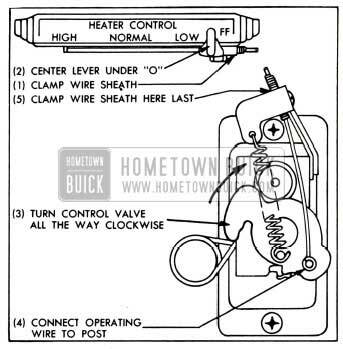 When 1951 Buick heating system is in operation a front door ventilator should be opened about 1/2″ to let out old air. The opened ventilator should be on opposite side from which wind may be blowing. The heater and defroster blower motors are supplied with current from the “Accessories” terminal of the ignition switch. The supply wire extends from the ignition switch to the fuse block under the cowl where a fuse is located to protect the circuit. Wires from the fuse block connect to the heater and defroster switches and from the switches to the motors. See chassis wiring circuit diagrams in Section 10-J. 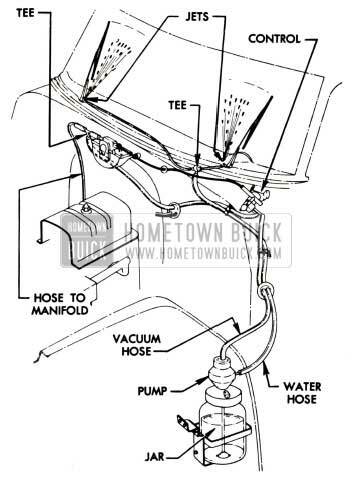 The 1951 Buick windshield washer assembly consists of a vacuum operated water pump and a glass water jar. The assembly is mounted in a bracket attached to the left front fender skirt where it is accessible with hood raised. 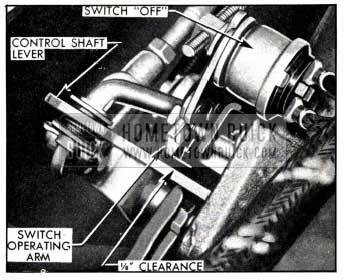 The inlet at top of pump is connected by a rubber hose to the control mounted on left side of instrument panel, and the control is connected by hoses to the intake manifold. The outlet at side of pump is connected by hoses to the two spray jets located at lower edge of windshield glass. See figure 11-3. When the 1951 Buick windshield washer is filled for use during seasons when freezing of water may occur, Windshield Washer Anti-Freeze Solvent No. 980740 should be used. Do not use water containing alcohol or other anti-freeze materials as damage to car finish may result. If the 1951 Buick windshield washer does not operate when control valve is used as instructed, check to make sure that water is in the jar. Examine all hoses for leaks or sharp bends, and check hoses for correct connections as shown in figure 11-3. The 1951 Buick windshield washer jets on Series 50-70 have a swivel base and are locked by a jam nut. If the water stream is not properly directed upon the windshield glass its direction may be readily changed. Loosen jam nut slightly, turn jet with a screwdriver as required and tighten jam nut. 1951 Buick back-up lamps are a factory installed 1951 Buick accessory. The installation consists of a lamp mounted in each rear corner of body and a switch mounted on the lower end of steering column. The lamp and switch circuit is protected by a fuse on the fuse block under cowl. The 1951 Buick back-up lamps are controlled by the ignition switch and the back-up lamp switch. When ignition switch is in the “ON” position, the lamps will light automatically when the transmission control lever is placed in the reverse position. 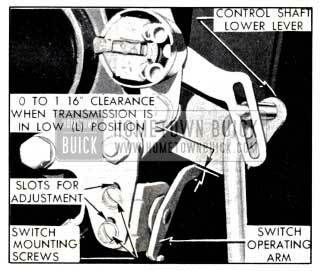 The 1951 Buick lamps will not light when control lever is in any other position, provided the switch is properly adjusted. This is a legal requirement in many states. 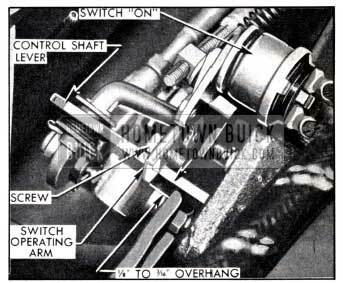 The 1951 Buick back-up lamp switch on cars equipped with syncro-mesh transmission is located at the lower end of steering column jacket and is operated by the transmission control shaft lever when placed in reverse position. Loosen hex head cap screw on switch operating arm and adjust length of arm until end of arm extends 1/8″ to 3/16″ beyond front edge of control shaft lower lever. See figure 11-4. Tighten switch arm screw securely. The 1951 Buick safety (spot) light is connected to the No.3 (taillight) terminal of the 1951 Buick lighting switch so that the light may be turned on only when the lighting switch is in the “parking” or “driving” positions. The wiring is protected by a fuse located in a splice type fuse holder in safety light lead near the lighting switch. Turn lighting and 1951 Buick safety light switches to “off” position. During the installation of the auxiliary lamps, the white wire to the parking lamps is disconnected from the No. 2 terminal of lighting switch and connected to a 3 1/2″ extension attached to one terminal of the auxiliary light switch. The other terminal of auxiliary light switch is connected by a jumper wire to the No. 2 terminal of lighting switch. The auxiliary lamp wiring is protected by the thermo circuit breaker on the lighting switch, and also by a 14 ampere fuse mounted on the lamp switch.